In this 2010 file photo, Leo Shaw smiles at his significant other, Eugenia Bryan, as the two slow dance during an Oldsters United for Responsible Service dance at the Eagle’s Lodge, 1803 W. Sixth St. Shaw, who is the president of the group, says they’ve been organizing weekly dances since 1981. For more than 30 years, the band played on. 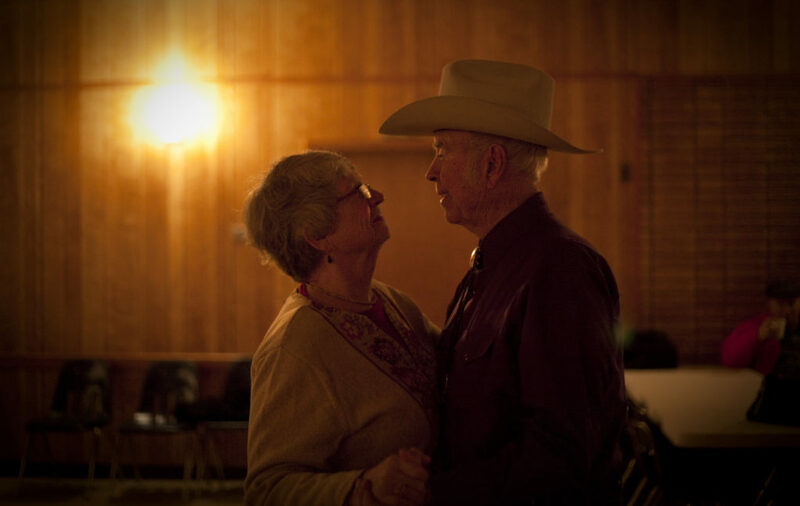 Since 1981, Leo Shaw and his friends have sponsored dances through their nonprofit organization, Oldsters United for Responsible Service, or OURS. The toe-tapping retirees have weathered a lot in their years together — being forced to leave their original venue, the Lawrence Senior Center, in 2007 was the first big obstacle. Their second home, the local Eagles lodge, temporarily shut down after a skirmish with the national Fraternal Order of Eagles organization, forcing OURS to find a new venue. They found refuge at the Knights of Columbus facility for a few years, until it too shuttered in 2015. Then, it was back to the (reopened) Eagles lodge. But that wouldn’t last, either. After 37 years together, the Oldsters United for Responsible Service are hanging up their dancing shoes, possibly forever. With the Eagles building changing ownership July 1, the group has only two Sunday dances left together. From 6 to 9 p.m. June 24 will be the very last dance. Shaw, 88, isn’t optimistic about finding such a place. Every venue he’s checked out has either been too expensive, lacking adequate parking, or without an accessible entrance for older folks, he says. And then there’s the floor. They just don’t make dance halls like they used to. “The Eagles have the last wood floor anywhere around,” says Shaw, a retired master mechanic. “You can’t deny the fact that it keeps you going,” agrees Shockley, 76. In more ways than one, perhaps. The group has at least one centenarian, and its youngest member, Shaw guesses, is past 60 at this point. OURS provides an outlet to senior citizens, he says, through physical and social activity, food and fellowship. Each dance starts with a dinner buffet. For some members, it’s one of the few home-cooked meals they’ll eat all week, Shaw says. Shaw took his wife, Eugenia, to an OURS dance for their first date almost 10 years ago. They had both lost their spouses some years before, he says, and married soon after that first dance. He calls his style “Midwestern ballroom.” The group does a lot of two-stepping, line dancing and waltzing. The roughly 40 people who make up OURS’ core membership, Shaw says, don’t want to say goodbye. They don’t want to lose contact. Shockley, a retired sign language interpreter, says she and her husband should “have no trouble” filling their time when the Eagles lodge closes. With six grandchildren and nine great-grandchildren, that shouldn’t be a problem. She worries about the others, but hasn’t given up hope completely. Not just yet. “As a group, I think people will go through a period of loss. But what they will hold onto is the fact that we’re going to keep looking,” Shockley says.